It’s a creative and playful motor activity in which very young children are allowed to experience their physicality, to learn new movement schemes, and to vent their expressiveness. Children are allowed to start discovering the world of the circus arts, the basics of acrobatics and of the aerial apparatuses, balancing and trampoline are a funny game. Children improve their dexterity, their self-perception, self-confidence and learn to work as a team with other children. Acrobatics, balancing, juggling and aerial acrobatics are the subjects of this course addressed to young teenagers. Difficulties are overcome with simplifying apparatuses, assistance techniques and a specific athletic preparation. In this phase the individual characteristics and inclination of each pupil is taken into great consideration to help along their personal and artistic development. 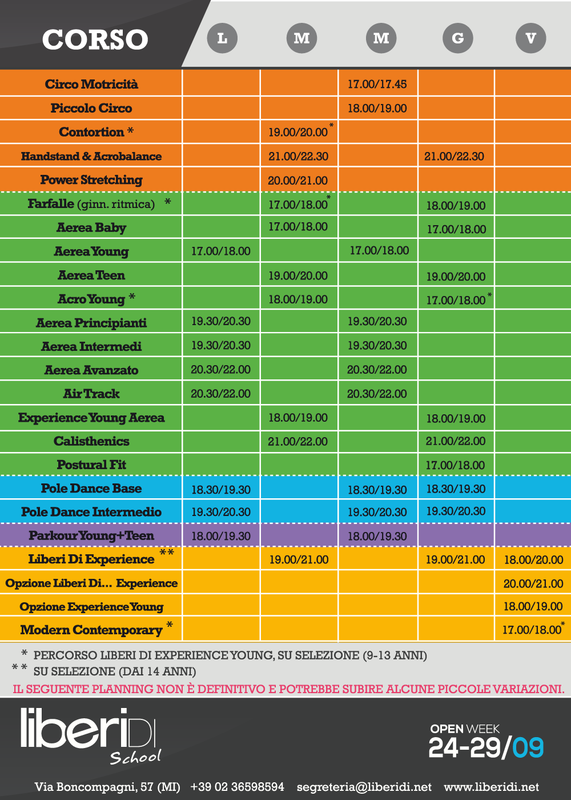 For the first time in Italy Liberi Di… offers you the possibility of experimenting circus acrobatics with your kids! Creativity and expressiveness of both, parents and children will be put into play. you will increase your trust in each other, your strength, and your balance and control. Aerial acrobatics is the union between the aerial techniques of circus with the harmony of movement of dance. Leaving the ground to face an aerial act means preparing one’s body to hold on to ropes, silks, hoops or trapeze, learning how to live and give magical emotions connected to the risk of flying. The noun comes from the ancient Greek “Acrobateo” meaning growing and progressing. This discipline requires courage, agility and endurance, you will need the right mix of strength and flexibility. The main purpose is to have control of both your body and mind. You will also develop your self-perception using techniques from artistic gymnastic, to parkour and martial arts. New training activity inspired by crossfit and circus acts. Improve your strength, flexibility and endurance!